Great results for the Indigo (design 144) and TEN (design 147) in the 50ft miles dualhanded. Both boats finished 1st in their class. 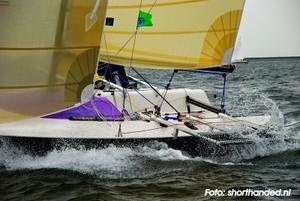 The 26ft Indigo was abolute the second monohull overall after the 38ft ‘Hemels van der Hart”. The 33ft TEN was absolute the 4th monohull overall.